On the 26th of October, Aaron (Dad), Wendy (Mum) and little Esmé went to A and E at Norwich and Norfolk after Esme had been ill for a number of weeks, alongside most of the other family, but hers continued when everyone else got better. Wendy had taken Esmé to the Dr's previously and they had been told it was just a normal sickness virus going round and to go home and call 111 if things didn't improve. The next day, on the Friday 26th, Esmé was still being sick and had gotten weaker after several weeks of vomiting and so after a couple of attempts of calling 111, Wendy, knowing her daughter better than anyone, took Esme to A and E and was admitted to hospital straight away as she knew something was not right. Esmé had blood tests done, which came back all clear, aside from a slightly irregular white blood cell count, and so the plausibility of the problem just being a bad virus or an infection remained. She was then put on fluids via a cannula as she had become very weak and dizzy from all the vomiting and could not keep anything down. She was sent for an ultrasound the next day, which came back all clear, but she continued to deteriorate. Esmé was not able to sit up or move herself other than her hand and you could see how visibly disorientated she was as when nurse or Dr would walk in the room and her eyes would roll and look in the wrong direction as she tried to focus on where the sound came from. There was a day or so of hope that it was in fact just a bad infection and she was fighting it off when she seemed to recover out of nowhere and was sitting up, laughing and eating as if nothing was wrong. The next day, Esmé unfortunately became very weak again and dizzy. Her parents knew there was something odd happening as she would be sick every day almost to the minute of 3am, alongside being sick throughout the day, which would indicate something cyclical and not just a normal virus. On Wednesday the 31st she had an MRI in the morning, meaning she was put to sleep for about an hour, and the parents were told this is just routine, as the other tests came back clear, to rule out anything very serious but the indication that it was still just a virus remained. They were told the results would be back later in the evening or the next day when they had been examined by specialists at Norfolk and Norwich and also a second opinion from an outside specialist from a different hospital just to confirm. Only a few hours later in the afternoon, there was a knock at the door in which Esmé and Wendy had been staying and a specialist nurse and consultant came in. Before she opened her mouth we knew she was about to say something truly terrible. She asked 'would you like to do this here or in a separate room?' but her face said it all. Aaron and Wendy replied that they wanted to hear it now in that room. The Dr replied with the words 'I am so sorry to tell you that your daughter has a brain Tumour' 'I am sorry' and their world fell apart. After a few moments of them words sinking in, Wendy managed to ask 'how big is it?' and the response was a fumbled 'it is a large mass at the back of her brain'. Aaron nearly collapsed from shock and they both sobbed uncontrollably. They were then informed an ambulance would take them to Addenbrookes with blue lights as she would need treatment immediately to remove the pressure on her brain. The tumour was growing in the Cerebellum and so it was pressing on the part of the brain responsible for balance and motor-skills which is why she had the dizziness, lack of movement, and constant sickness. If it was not growing in this location then they may not have had any symptoms until it was even further advanced and possibly untreatable. 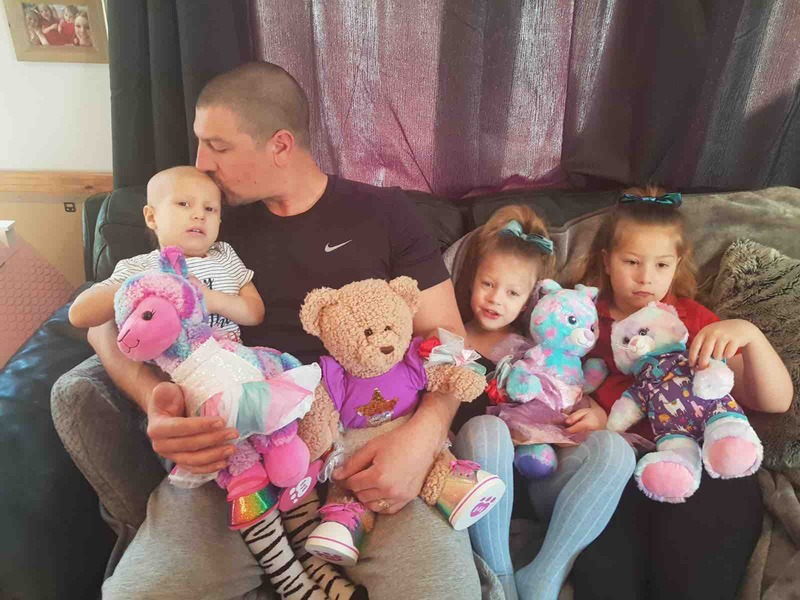 A short while later, the ambulance arrived and they were taken to ward C2 Child Cancer (oncology) and Blood Disorders (haematology) at Addenbrookes where there was a bed waiting for her. She was administered steroids to relieve some of the pressure on her brain and was put back on fluids and given other meds. She had a number of tests done throughout the night and so continued her parents weeks of not sleeping but this time knowing the worst news possible and not knowing what lay ahead for their baby girl who is not even two years old yet. Due to the location of the tumour, Esmé was required to have a second MRI as there was a chance that the tumour could have spread down her spine, through the cerebral fluid which protects the brain and spine, and so she had a second head and full spinal MRI after being put to sleep again. The anxious and horrible wait began again as they waited for this second set of results as they tried to entertain Esmé and focus on how well she was doing so far since the pressure was taken off her head and she was able to play and eat again, although she definitely was not herself as the steroids mess up your hormones and so she was a little grumpy at the world for this reason and being poked and prodded throughout the day and not knowing why. The results of the spinal MRI came back clear and was the first bit of good news they'd had in quite a while and so a brief moment of elation crept back in and positivity returned. Having a large family with aunties, uncles, nannies and friends, there was always many visitors to see Esmé and also help out with their other children whilst the parents spent day and night at the hospital by her side. The next day, Aaron and Wendy had a meeting with the 2 surgeons, tasked with saving Esme's life, who examined her MRI results and told them the plan of action. Esme was to undergo brain surgery on Tuesday 6th of November to extract all or as much of the tumour as possible but erring on the side of caution so as not to cause damage to the surrounding brain tissue then they would do another MRI to see what/if anything remained. They would also send the extracted tumour off for analysis to determine what type it is and what further action would be needed. Tuesday the 6th came around after a long and blurry few days. Aaron and Wendy experienced mixed feelings of fear, anxiousness and also anticipation to get the surgery out of the way and get that horrible thing out of their daughters head. They were told the operation would be about 6 hours but not to be alarmed if it was a little longer or a little shorter. Every surgery is different. When the team came to get Esme, she wanted to be wheeled there in one of the cars from the ward and so she was indeed taken there with her entourage (family) following beside and behind. Her parents went in with her while she was put to sleep then came out and so began the longest wait of their lives. The 6 hour mark came and the nerves and stress felt by all was palpable. Esmé had a big group of family members waiting for her in the hospital trying to distract themselves and Aaron and Wendy from what was going on a few floors up in the main operating theatre. The 7 hour mark came and the piles of empty coffee cups mounted up on table. The nerves turned to full blown anxiety as negative thoughts crept in. 'Something must be going wrong' 'why aren't they coming to get us?'. At just under 8 hours, one of the 2 main neurosurgeons working on Esmé actually came down to the concourse to find us to say they are just finishing up and it all went as well as it could. The reason it went on a bit longer was because they actually managed to extract everything they could see with the naked eye and they did not expect to be able to do this first time round so they just kept going. This was the news we had all being wishing and waiting for. The family broke down in tears of joy knowing she had not only survived such a traumatic experience but that she had done so well out of it. Esmé was put in intensive care after her surgery but went from strength to strength very quickly. Her vital signs were all stable and she was responding well to the meds and was actually semi 'awake' with eyes intermittently open and semi conscious although continuously falling back asleep but it was a very good sign. The ICU nurses were so pleased with her progress that they said she was OK to leave intensive care less than 24 hours after her op and she was to be returned to C2 ward where she would still receive the unbelievable care of the staff on that ward as she was before her op. She would need another MRI, her third brain scan in a short space of time and 4th time being put to sleep, the day after her surgery to confirm what the surgeons thought and hoped was correct, that they had removed every bit of visible tumour. Esmé went from strength to strength over the following days and 4 days after having major brain surgery she was walking up and down the ward!! (whilst holding 'Dandy's' (daddy) hand. Everyone on the ward was astonished and her family elated. The results from the final MRI came back and the best news the family could have ever hoped for became a reality. They could not see any trace of the tumour on the in-depth brain scans. The family broke down in tears of joy. This coupled with the fact she was eating well, talking, smiling (at those privileged enough for her to smile at!) and walking about. The physios came round each morning and were so pleased with how she was getting on and surprised how there had been no adverse effects from the surgery at all in terms of movement/balance. The speech therapist said the same and the specialist nurses said how well she was doing in terms of her vital signs all being constant and stable considering the physical trauma she has been through. The next major milestone and waiting game was for the tumour analysis results to come back from the lab. These came in on the morning of Monday the 12th of November and so the meeting between the parents, a neuro consultant and one of the surgeons that operated on Esme was to be that afternoon. 1) Either no further treatment but scans every 3 months to make sure there is no signs of its return. 2) Light chemotherapy (a few sessions of it) to flush out any possible remaining cells if the type of tumour required. They had obviously hoped for option 1 but felt it likely to be option 2 and thought at least this way they could be sure any remaining cells that did not show on the scan would be flushed out to eliminate any chance of regrowth and spread. They were called in to the meeting that afternoon and got the most devastating news it was a malignant tumour and so it can be said that she has cancer as the tumour they removed was a rare form of malignant brain tumour called an Ependymoma. They would recommend radiotherapy if she was an adult but as she is so young, radiotherapy would have major adverse effects on her brain and so on her development. Their world fell apart as they had high hopes from receiving the all clear from the MRI. They want to try her for 1 year of intense chemotherapy, as the likely hood of cells still remaining are high according to previous cases of this rare form of tumour, and so this chemotherapy has a 40% chance to be successful. She will have 4 different types of chemotherapy drugs, a different one every 2 weeks on an 8 week cycle. Each one has terrible side effects and so they need to cycle them so that she isn't suffering from one particular side effect for too long, such as low white blood cell count or damage to her bone marrow. This also stops any remaining cells from being able to adapt to one type of drug much in the same way as bacteria can adapt and mutate when treated with antibiotics as they can mutate quickly and this would be even more detrimental to her recovery. If this 1 year of chemotherapy is not successful then she may have to either have another year of therapy or radiotherapy but they are trying to avoid the latter at all costs on the advice of the surgeons. She will have a lumbar puncture in the coming week or so to extract some fluid and check if any cells have travelled down her spine that could not be seen on the previous MRI as they'd be too small to show up. She will have to have a Hickmans Line inserted in to the on of the main arteries that goes in to her heart so that her chemotherapy drugs can be inserted easily, safely and without the need for a new cannula to be put in every few weeks as this is not a comfortable thing to have done. Both the lumbar puncture and Hickmans Line require her to be put to sleep. The family have been sent home the evening after the meeting a few hours earlier so that she and they can recover before they return to hospital next week to get the lumbar puncture done and the line put in the following week. Esme will then begin chemotherapy the following week. 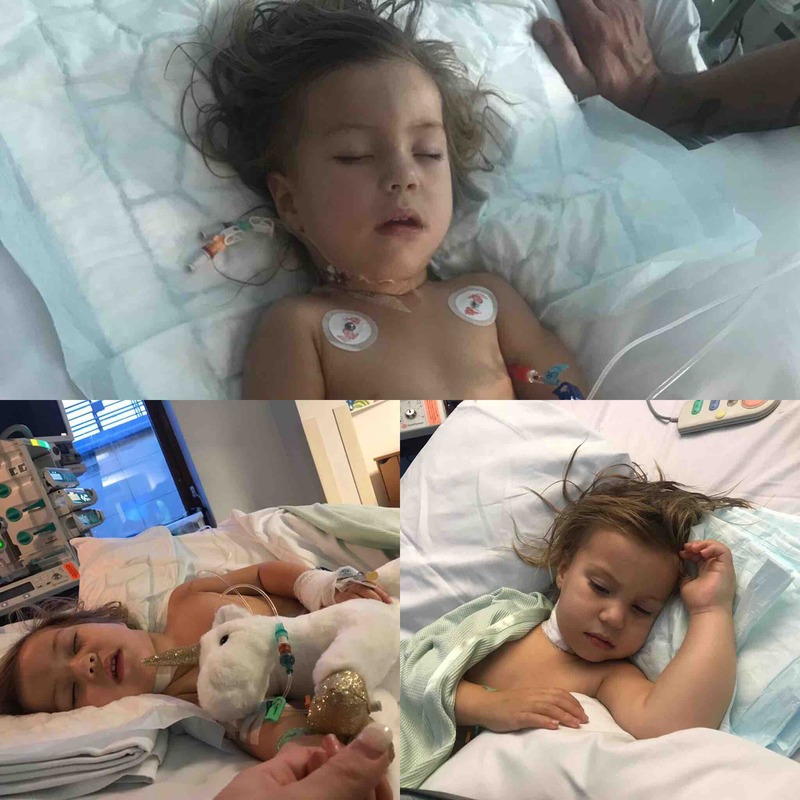 This is obviously a worst nightmare situation for the family considering two weeks ago they thought she had an infection or a virus and since then their beloved youngest daughter has had brain surgery and now they have a long and very rough road ahead. Esme will be poorly from the year of chemotherapy, being in and out of hospital probably every week realistically as well as being at home feeling very unwell. She will loose her hair soon after therapy starts and will have a much lowered immune system so the risk of illness or infection is high. 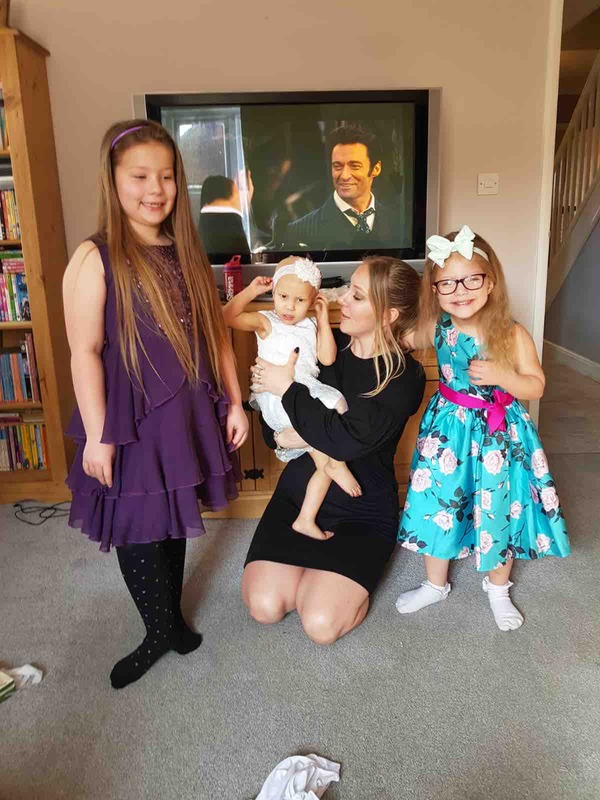 Esmé is 1 of 4 children, Sienna 4, Lillie 7 and Jordan (her only brother) is 14, and so the parents have had the unthinkable task of having to tell them what is going on with their youngest sister. This has been particularly difficult on Jordan as he is old enough to fully understand what is going on and loves her dearly. The family need to be together during this very difficult time and with the constant trips to the hospital (Addenbrookes being 1 hour and 10 minute drive from Swaffham) we are trying to raise as much money as possible to try to ensure Aaron can be off work for this coming rough year ahead to support his wife, other children and of course Esme who dotes on her Daddy and feels he is her rock. She has clung to him since they all went in to hospital weeks ago and does not want him out of her sight, calling 'Dannndy!' if he leaves the room. Friends and family will doing lots of fund raisers throughout this year for the family and the ball is already rolling with many of them but the Go Fund Me page is the primary place to support if possible as they can access this quicker to pay their bills each month. 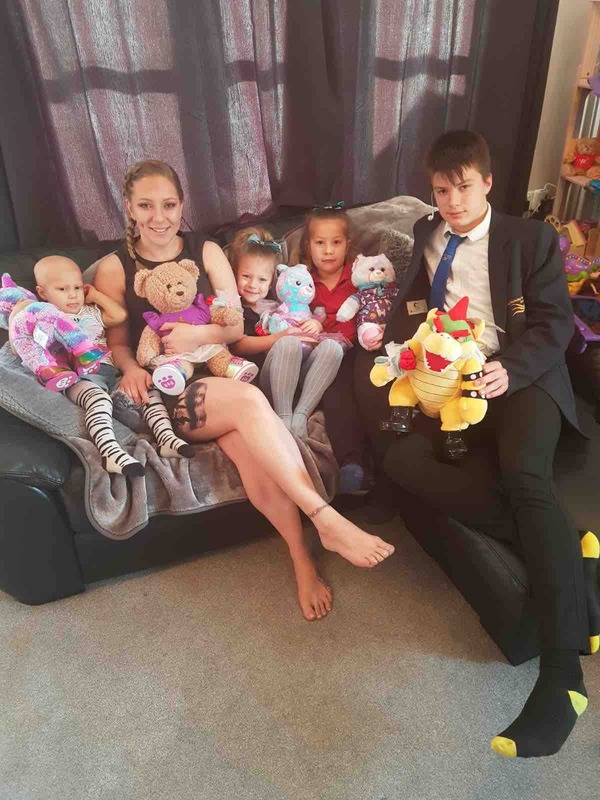 They are a strong and loving family unit that appreciates each and every day but need all the help they can get right now at what can only be described as the most difficult and uncertain times. Thank you very much for reading and giving it your attention.